In an earlier post, I promised a bit of news. Upon further review, I am not sure it counts as "news" – because the information has been public since April, if you knew where to look. So let's call this "an announcement." There's gonna be a paperback. 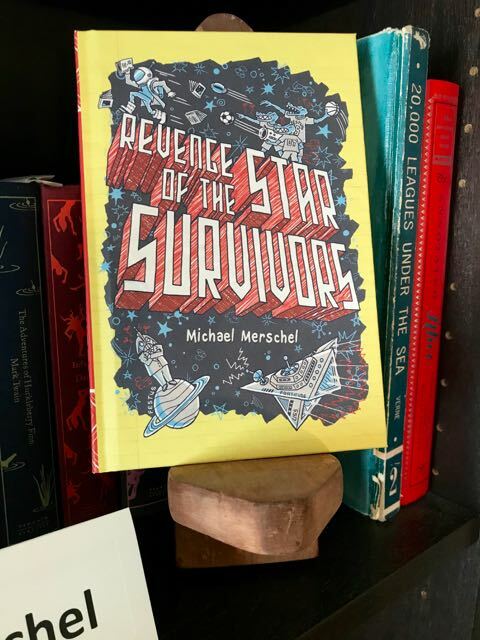 On Oct, 16, readers who find hardcover books to be too inflexible and ebooks to be too electrical will be able to purchase Revenge of the Star Survivors in an entirely new format. The words on the inside remain the same. Except for one comma. And a turtle. The publisher also remains the same, and for that I am glad, because Holiday House has been a wonderful starbase for this writer. However, I am pleased to point out, for my friends in the bookselling business, that Holiday House is now distributed by Penguin Random House. I am pretty sure that Penguin Random House is sort of like the Force in that it flows in and around all things, at least in the bookselling world, which I hope means that if you ask for a copy at your favorite bookseller, you'll be able to find it with even less hassle than ever. And thank you to everyone in the galaxy who got us to this point. Excelsior!